Tamaki River shown in dark blue. The middle of the estuary looking east. The Tamaki River is, despite its name, mostly an estuarial arm and harbour of the Hauraki Gulf, within the city of Auckland in New Zealand. It extends south for 15 kilometres from its mouth between the Auckland suburb of Saint Heliers and the long thin peninsula of Bucklands Beach, which reaches its end at Musick Point. The inlet extends past the suburbs of Glendowie, Glen Innes, Tamaki, Panmure, and Otahuhu to the west, and Bucklands Beach, Halfmoon Bay, Farm Cove, Sunnyhills and Pakuranga to the east. It has several smaller "tributary arms" which extend from it: the Pakuranga Creek and Otara Creek in the east, and the Otahuhu Creek and Panmure Basin in the west. 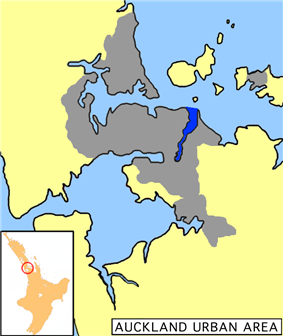 The Otahuhu Creek forms the eastern shore of the narrowest point on the Auckland isthmus: here it is less than two kilometres to the waters of the Manukau Harbour, an arm of the Tasman Sea. Portage Road is the location of one of the historical portage overland routes between the two coasts. Here the Maori would beach their waka (canoes) and drag them overland to the other coast, thus avoiding having to paddle around North Cape. A second portage was named Karetu and went between the extreme north-east corner of the Manukau harbour to a bay close to the site of the newest bridge across the Tamaki, about 1 km south of the Panmure basin. The portages made the area of immense strategic importance in both pre-European times and during the early years of European occupation. 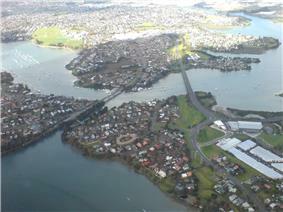 In 1865, the estuary was first crossed by a steel swing bridge, located at Panmure, to improve connection between Auckland and Howick.The location is 20m to the left of the left hand (Panmure) bridge shown in the photo. Stones and steel had been imported from Australia, possibly reflecting the still very basic nature of industrial construction in the young colony. In the 1890s the mouth of the river was used as a safe anchorage for ships carrying explosives. One such ship, anchored in the mouth of the estuary, caught fire and exploded with loss of life. After this the explosives buoy was moved into a more open area east of Browns Island (Motukorea), where it is still located. In 1925 a 6ft 2" leopard that had escaped from the Auckland Zoo three weeks earlier was found dead in the Tamaki river by a fishing party in Karaka Bay. Due to its extent north-south and its position between Auckland City and its eastern neighbour Manukau City, the River is a natural barrier to traffic, especially as only three bridges cross it, all heavily trafficked and increasingly incapable of taking the peak hour flows. The AMETI scheme has the resolution of this bottle-neck as one of its goals. The Tamaki River also has a marina / ferry wharf at Half Moon Bay, from where commuter ferries depart for the Auckland CBD and car/passenger ferries for Waiheke Island. Many yachts are also moored in its relatively well protected interiors. The river channel is marked with large green buoys. Deep draught vessels should stay close to the buoys as the channel, although averaging 20 m deep is very narrow in many places. Near the large Point England sand spit there are numerous mudflats which are barely covered at high tide. The speed limit in the river is 10 km/h (5.4 kn). Rocks at the Western mouth of the river at St Heliers are marked by a distinctive barber's pole. Vessels of more than 4 m draught should not attempt the opening between Musick Point and Browns Island. The channel in this area is marked by port and starboard markers about 20m apart. It is 0.5 km North West of Musick Point. Large mussel beds extend out 200 m from Browns Island into the river.